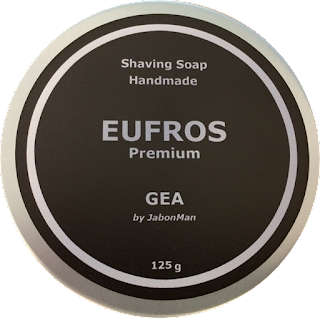 Every once in a while, you hear buzz about a hard to find shaving soap that’s getting lots of attention. I’ve checked back on my community and only seen it come up about 3 times in the SOTD postings so I’d say It’s pretty obscure. I never found out who or where this artisan was or how to order it until about four months ago when my friend Melvin Hollenberg who lives in the Netherlands sent me this letter explaining he wanted to contribute to our giveaways and provided us with two shaving soaps and a straight razor as well. The straight comes from the company Solingen and it’s just stunning. The soaps are from Spain and we have two tins of them. One is premium tallow the other just says premium so no tallow. They just happened to be the ones I’ve been looking for but sadly for me, I’m not able to keep them because all of these items will be part of our Dec giveaway the last one of 2017. Company: The Real Shave CO. So far, our UK care package has given us some wonderful products to talk about and this week is no exception. 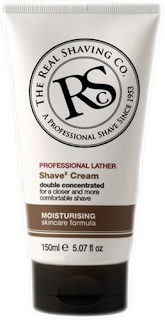 Today I bring you a shave cream and post shave balm from The Real Shave Company. Hard as I might I couldn’t find the shaving cream under the name “Shave2” on the website. 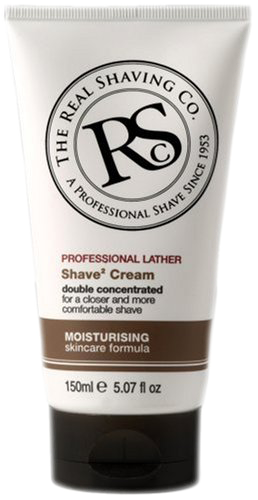 I think it now goes by the name of "Traditional Shave Cream" this unique shaving cream is “Double concentrated” which gives you more slickness and glide for a comfortable shave. The packaging is the standard tube with a flip to open lid. A giant RS logo on the front along with product name and description and amounts in ml and oz this one is 150ml or 5.07 fl oz. BTW after taking a second look, I found the packaging is now a light blue and no longer in the brown which is displayed here. Again, from the UK care package we have selected another shave cream called Erasmic for this week’s shave. This is a product of Amber House Ltd. The product states that it has the same great formula since 1886 but maybe they should tweak it a just a bit. A little more on that later. The packaging is very attractive with a bold red box with white text except for the product name which is in black and some other accents. The tube holds about 7.5ml with a screw on cap but I would rather if it had a flip top. Another look into our care package from the UK brings out a menthol delight called Denali a seasonal shaving soap from Phoenix & Beau based in Hitchin, Hertfordshire, a family business founded by Kerry & Sarah Burrows in 2015. Kerry spent nine months building and testing a formula that led to the creation of a vegan and, some time after, a tallow based soap. 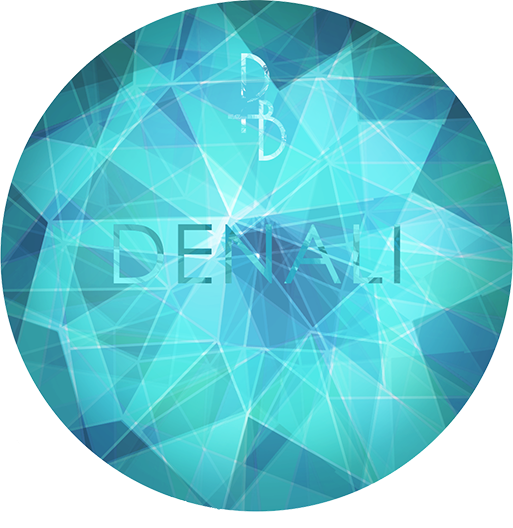 After extensive testing with the group “The Shaving Room” Phoenix & Beau was launched in February 2016 from Kerry’s home-based studio. Here they continue to work together to bring the wet shaving community amazing products. When Ghost Ship was first introduced I really didn’t think much about grapefruit being something I would like and then the reports started coming in by the droves all positive of just how great this shaving soap really was and being a wet shaver I just couldn’t resist so I jumped on board. Ghost Ship is the creation Kelly Hogan the owner of the now rebranded Beaver Wood right. Today they go by the company name of Black Ship Grooming. No matter what name your tub happens to have on it you can’t deny how amazing their shaving soaps and after shaves are. It’s surprising to know that this company started out making pens and rolling pins. The name Beaver Woodright was derived from Kelly residing in Beaver PA and his wood working prowess of which people who do that sort of thing are called wood rights hence the name Beaver Woodright. The name change happened in 2015 when the company focus turned to pirate themed shaving soaps and accessories. Many people had commented at shows that name just didn’t fit anymore so, after talking it over with his wife Black Ship Grooming was born.